It often strikes me as intriguing how many of the technologies that we so commonly use today are only a few years old. I remember the first flat panel plasma displays at a resolution of 840 x 480 and now the venerable plasma is for all intents and purposes a footnote in display history. As we know, LCD has taken its place and is now at up to 4K resolution. The evolution of the modern LCD flat panel has been rapid. So rapid that we have been attentive bystanders viewing the developments in real time. Now that InfoComm 2015 is history let’s take a look at the state of the LCD flat panel technology developments and see what else is on the horizon (including that impressive new direct view high-res LED technology). The most obvious development in flat panels over the last couple of years is 4K UHD resolution. Technically, "Ultra High Definition" is actually a derivation of the 4K digital cinema standard. However while your local multiplex shows images in native 4096 x 2160 4K resolution, the new Ultra HD consumer and commercial format has a slightly lower resolution of 3840 X 2160– but still noted as 4K. 4K delivers higher pixel density and thus more information on screen. Okay, for the naysayers out there you so have to sit closer to the image to see the big difference or see it on a big screen but when 4K resolution is matched with native 4K source material even the hold outs will say it is stunning. I would be remiss not to say that although not a display technology per se, there have been huge advances in content production, signal processing and distribution. There is a lot going on in 4K– and probably most important for the growth of the market, the prices continue to come down for entire categories of products. We are also seeing some form factor developments in flat panels. We are used to 16 x 9 aspect ratios but we are seeing a few manufacturers coming onto the market with ultra wide displays. Samsung, LG, and Philips have all introduced desktop models that are 21 X 9 aspect (often called “ultra wide”) and are now being made in curved models as well. For those looking for something a bit larger, we have now seen the launch of 21 x 9 aspect 105 inch displays from LG and Samsung. Speaking of curved screens, we have seen some versions on the consumer side mainly from Samsung and LG with the appropriate market hype but from the commercial perspective there were prototypes at the InfoComm show by invitation only that showed larger flat panels with a much more pronounced convex (not concave) curve that would fit around a circular column. It might just be a proof concept but there is clear evidence that it can be done. In terms of image size, I have always subscribed to the bigger is better school of thought on displays. We have grown from the ubiquitous 40 inch to over 80 inch varieties but what must be called really big flat panels are the theme of the day. Sharp holds the current title at 120” and Samsung close behind at 110” with both sporting 4K UHD resolution to take advantage of all that size. Just when I was thinking my 70” display was big. The best video wall/flat panel display manufacturers are offering bezel sizes in the “Narrow” range: about 3.5mm bezel width. But only a few Video Wall manufacturers are making “super narrow bezel” products available with a bezel size of as little as 1.8mm. Shown here, the new VH7B series from LG, who now hold the title, as they introduced a 48.5”and 54.6” at InfoComm, featuring an unprecedented bezel-to-bezel measurement of about 1/16th of an inch (1.8MM), allowing displays to be connected near seamlessly with othersMost of you are aware of another battle of sorts and this has another chapter added to it. Of course I am speaking about the bezel thickness wars. With videowalls seemingly exploding all around us, the need to reduce that intrusive mullion between flat panel displays has been front and center for some time. LG for now holds the title. They introduced a 48.5”and 54.6”, featuring an unprecedented bezel-to-bezel measurement of about 1/16th of an inch (1.8MM), allowing displays to be connected near seamlessly with others. This is the latest volley but stay tuned for the next round that we are told may be zero bezel. Yes, necessity is the mother of invention. Moving our attention from what we see outside to what is inside, let’s take a look at four ongoing developments that in some senses we will never see at least as standalone technologies. A key area in LCD technology is illumination and the backlight. We began with CCFL or cold cathode fluorescents and then moved to LED as a light source. There are many advantages not the least of which is power savings, more uniform and accurate illumination, display heat dissipation and last but not least the ecological benefits. We are seeing continuing developments in direct view and edge lit LED backlights but another technology is also being developed called Quantum Dot (QD) first introduced by Sony. One current use of QDs is to improve the backlighting. Instead of using white LEDs for backlighting, light from a blue LED is converted by QDs to relatively pure red and green, so that this combination of blue, green and red light incurs less absorption of unwanted colors by the color filters behind the LCD screen, thereby increasing useful light throughput and providing a better color gamut. The effect of QDs is quite noticeable in side by side comparisons with older LCD technologies. From a manufacturing point of view another intriguing development is IGZO technology, introduced by Sharp. The IGZO name is an acronym for indium gallium zinc oxide, the semiconductor material on which the LCD screen is based. Each pixel in an LCD screen is controlled by its own transistor and making those transistors on IGZO brings several advantages over the amorphous silicon that is used in many of today's LCD panels. Electrons move faster in IGZO and that brings benefits in current flow that mean the transistors can be made much smaller. Because the size of the transistor directly affects the size of the pixel, a smaller transistor allows for smaller pixels and so more can be crammed in per inch than a non-IGZO panel used more pervasively today. As a point of reference in actual use today, think of the current crop of Retina displays with more pixels per square inch and the image benefits that are obvious as display get bigger and bigger. An added benefit is that IGZO is applicable to both LCD and OLED displays. Another development that we do not readily see immediately is the inclusion of Simple Network Management Protocol (SNMP) in displays. It is an Internet-standard protocol for managing devices on IP networks. Historically, we have had devices that typically support SNMP, including routers, switches, servers, workstations, printers, modem racks– and now finally displays, as LG showed at InfoComm 2015. SNMP is widely used in network management systems to monitor network-attached devices for conditions that warrant administrative attention. Having this available on large scale displays is a great addition, but one that may be overlooked. Consider the ability to monitor and manage the health of multiple displays across an office complex using standard tools the IT department already has. Also, think about the implications for digital signage applications. One last development that we see gaining traction is System on a Chip or SoC for short. Samsung did most of the pioneering work on this and now has been followed by others. The SoC is a mini computer built into the display in the form of a chip. It can act as a media player for digital signage or perform other computer-based tasks but it eliminates the need for external devices in many cases. Some of these, like the units developed by Samsung run proprietary software, but we are seeing more “open” platforms, like the WebOS SoCs offered by LG, and the Android powered devices offered by BenQ. Samsung’s new 1.2, pixel pitch direct view LED, shown at the Samsung booth at InfoComm. In addition to Samsung, SiliconCore Technology, Daktronics, Christie, Leyard, NanoLumens, and Panasonic showed narrow pixel pitch direct view LED at InfoComm, unveiling a range of various direct-view LED display options ranging in resolution from 1.2mm to 2.6mmWe have covered many of the current trends in LCD flat panels but other flat panel technologies will compete for the limelight. Of course there is OLED which has been on the horizon for a few years and recently gained some fame in the consumer world. At some point OLED will encroach on the traditional commercial LCD that we have come to love. But more compelling this year than OLED: more and finer pitch direct view LED displays which can also be classed as flat panels. The current state of the art in this area is a 1 millimeter pixel pitch model that looks good enough to watch the big game on from a few feet away. Samsung’s new 1.2, pixel pitch direct view LED, was shown at the Samsung booth at InfoComm. 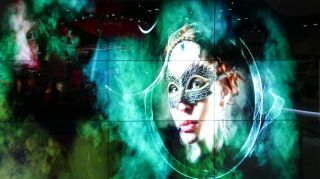 In addition to Samsung, SiliconCore Technology, Daktronics, Christie, Leyard, NanoLumens, and Panasonic showed narrow pixel pitch direct view LED at InfoComm, unveiling a range of various direct-view LED display options ranging in resolution from 1.2mm to 2.6mm. Technological development in flat panel displays will never cease and it is a lot of fun to try to keep track on the latest and greatest, as we continue to be amazed at the unknown and unexpected– including thin bezel, outdoor applications, and new LCD technology evolution.